Last month there was a strong focus on the foot and ankle complex and it is time to come back to an old biomechanical concept - the windlass mechanism. I fear that some key concepts have been lost in our teaching as we move to follow new trends. So, just as I loved writing about the Cloward sign and research from 1959, we are going to take another step back in time. This time it is to 1954, when J.H Hicks wrote about the plantar aponeurosis and proposed a biomechanical model explaining how diverse the function of the joints of the foot are between weight bearing and non weight bearing. The medial longitudinal arch (MLA) height increases. The leg (tibia and fibula) externally rotates. A tight band appears (the plantar aponeurosis). I think many clinicians would agree that these observations are coupled with toe extension but what he came to understand further through investigating both live subjects and cadavers, is that these observations occur in both situations, concluding therefore that the mechanism was not primarily due to muscular activity (Hicks., 1954, p.26). The windlass mechanism refers to the function of the anatomy on the base of the foot, specifically the plantar aponeurosis, sesamoid bones, plantar pads and the attachment of these structures under the MTPJ. The term ‘windlass' actually is a verb used in sailing meaning to haul or lift something using windlass. Hicks, and other researches from this time used the word windlass to describe how the bow-string structure of the plantar aponeurosis hauls the calcaneus and first MTPJ closer together and is done so when the first ray moves into extension. The outcome of these bones moving closer together in distance is a rising of the metatarsals forming the apex of the triangle and resulting in the MLA rising. Below is an image that outlines how the base of the great toe acts at the windlass, while the plantar aponeurosis (PA) is the bow-tie connecting the calcaneus to the MTPJs across all five toes. "The PA is a strong elastic band spanning the foot longitudinally and connecting the calcaneus to the toes. It appears as a strong and thick band from the heel to midfoot, from which point it fans out into five slips that run underneath the metatarsal heads (MHs) and attach to the plantar side of the proximal phalanx of each toe" (Caravaggio, Pataky, Goulermas, Savage & Crompton., 2009, p.2491). When the heel strikes the ground, at the beginning of stance phase, the ankle is in dorsiflexion. From this point the tibia “rotates inwardly and the hind foot or triple joint complex (subtlar, talonavicular, and calcaneocuboid) moves into a more everted or valgus position whereas the tibiotalar or ankle joint plantar flexes" (Van Boerum & Sangeorzan., 2003). The movement of these joints creates a pre-loading effect on that plantar aponeurosis as the foot pronates towards the foot-flat phase of mid-stance (Caravaggio, et al., 2009). When the foot reaches foot-flat or mid-stance, the tension in the plantar aponeurosis reduces and the foot is able to shock-absorp and adapt to the terrain through midfoot supination or pronation depending on the demand. Once we move to the last 30% of stance phase and prepare for push off, the great toe starts to move into extension, which again tightens the plantar aponeurosis and assists with re-supination of the foot (Caravaggio, et al., 2009; Kappel-Bargas, et al., 1998). During the normal gait cycle between 45-55 degrees of great toe extension is required (Neumann., 2013). Caravaggio and associates (2009, p. 2498) also confirmed that while the PA attaches through 5 slips to all five toes, the most load occurs under the 1st MTPJ and this load reduces with lateral movement, with the 5th toe being the lowest load. As first MTPJ extension increases, the height of the MLA should also increase. What Kappel-Bargas et al (1998) reported however, is that some people have immediate movement of the arch when the toe first extends and others have delayed movement of the arch. Both of these behaviours were different to the normal pattern. At this time, nearly 20 years ago, these authors speculated that early onset of arch movement with first MTPJ extension would perhaps predispose the arch to higher tensile loads, while delayed onset of movement was more commonly seen in people with increased rear foot angle and more mid foot pronation. Both scenarios result in an ineffective windlass mechanism. 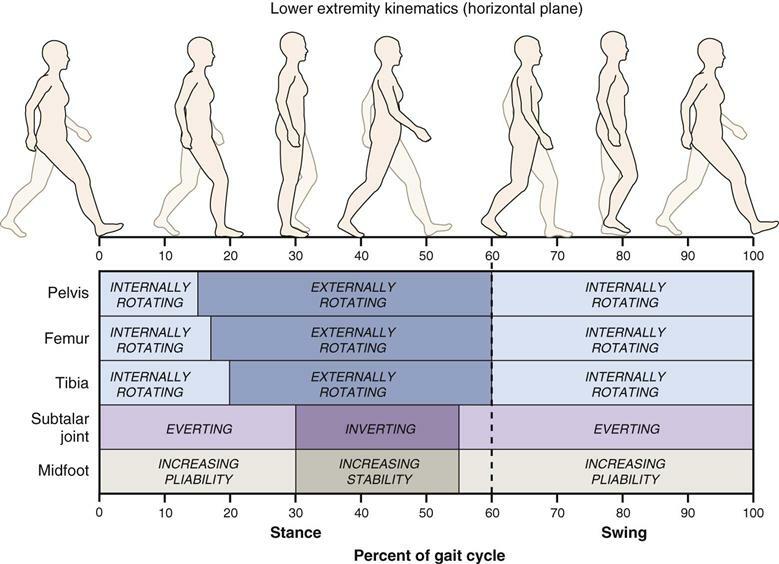 I love this diagram below which describes the horizontal plane kinematics of the gait cycle. How do we test the windlass mechanism? Great toe extension in weight bearing. You can use the windlass test to examine the amount of toe extension in weight bearing by lifting the big toe and evaluating the impact it has on the arch (Bolga & Malone., 2004). In patients with plantar fasciitis, this test is considered to be positive if it reproduces pain in the medial calcalneal tubercle (Bolga & Malone., 2004, p. 79). Regardless of whether there is plantar fasciitis or not, this test will tell you if movement of the MLA is normal, early or delayed. Tibialis posterior strength and endurance. A major active supporter of the MLA is tibialis posterior, which acts eccentrically during the shock absorption phase of gait to prevent arch collapse and eversion of the foot (Bolga & Malone., 1998; Van Boerum & Sangeorzan., 2003). Tib post is not the only muscle to consider though. "The combined effects of the flexor digitorum longus, flexor hallucis longus, peroneus longus, and Achilles tendons permit the supination needed to enhance the windlass mechanism” (Bolga & Malone., 2004, p. 79). Rearfoot/calcaneal angle. A mentioned above it is important for the rear foot to move from supination to pronation and back to supination again. Understanding the starting position of the calcaneus and movement of the calcaneus during plantar flexion with toe extension will guide our understanding of how the medial arch behaves during gait. Palpation - of the first MTPJ joint, of the PA and surrounding soft tissue structures of the foot. Where should treatment be directed? Calf tightness, achilles tendon tightness and ankle dorsiflexion stiffness are all risks for plantar fascia overload. Cheng et al (2008) were interested in further understanding the relationship between dorsiflexion angles, achilles tendon force and the impact on plantar fascia and the windlass mechanism to help direct treatment strategies that reduce plantar fascia strain in plantar fasciitis. From their study they found that 2/3 of plantar fascia strain is attributed to great toe extension and the remaining 1/3 to achilles tendon force. They confirmed that when under load, the region of maximum stress of the plantar fascia is near the medial calcaneal tubercle (2008, p. 1942) which correlates with common clinical presentation of medial heel pain during weight bearing. The results showed that higher loads occur on the plantar fascia under the first toe and reduced when moving out to the 5th toe which may offer an explanation as to why people weight bearing through the outer border of their feet when they have plantar fascia or toe pain. But if walking occurs without great toe extension, not enough pressure is applied to the plantar aponeurosis to effectively raise the MLA which may place the foot in a biomechanically disadvantaged position with an ineffective windlass mechanism. Therefore, retraining plantar flexion with pressure through the great toe is important for normal biomechanics. PROM and AROM is key. Tension to the plantar aponeurosis occurs through both toe extension and ankle dorsiflexion. Look at static & dynamic posture. It is a good idea to observe our patient’s foot posture during quiet stance and gait, looking at the foot from front, side and behind to understand the resting versus dynamic posture. When looking at static posture consider more than if the foot is pronated or not. Look at the foot from behind and measure the rear foot angle to understand what impact the resting position of the calcaneus has on the windlass mechanism. When looking at the foot from the side it is easy to see that if the first metatarsalphalangeal joint does not have extension ROM it will flatten the arch. Remember that posture does not equal pain. Don't forget about the muscles. Muscles that have the ability to influence height of the medial longitudinal arch include tibialis anterior, tibialis posterior, peroneals and gastrocnemius. Bolga & Malone (2004) made note to emphasise that foot static and dynamic posture can be influences by proximal neuromuscular control such as gluteus medius weakness, ankle dorsiflexion stiffness, achilles cord tightness, and tibialis posterior weakness. So while I encourage you to keep toe extension close to the front of your mind, be sure to see the bigger picture as well. The windlass mechanism aka movement of the medial longitudinal arch is essential for shock absorption and dissipation of forces through foot. It explains how the foot can act as both a rigid level and an adaptable shock absorber during the stance phase of gait. The aim of this blog was to rehash some old anatomy and biomechanical concepts and to remind you how cool the foot really is and how multifunctional the joints, ligaments and active structures are in the foot which act together to allow synchronous and effortless gait. Bolgla, L. A., & Malone, T. R. (2004). Plantar fasciitis and the windlass mechanism: a biomechanical link to clinical practice. Journal of athletic training, 39(1), 77. Caravaggi, P., Pataky, T., Goulermas, J. Y., Savage, R., & Crompton, R. (2009). A dynamic model of the windlass mechanism of the foot: evidence for early stance phase preloading of the plantar aponeurosis. Journal of Experimental Biology, 212(15), 2491-2499. Cheng, H. Y. K., Lin, C. L., Wang, H. W., & Chou, S. W. (2008). Finite element analysis of plantar fascia under stretch—the relative contribution of windlass mechanism and Achilles tendon force. Journal of biomechanics, 41(9), 1937-1944. Gelber, J. R., Sinacore, D. R., Strube, M. J., Mueller, M. J., Johnson, J. E., Prior, F. W., & Hastings, M. K. (2014). Windlass mechanism in individuals with diabetes mellitus, peripheral neuropathy, and low medial longitudinal arch height. Foot & ankle international, 35(8), 816-824. Hicks, J. H. (1954). The mechanics of the foot: II. The plantar aponeurosis and the arch. Journal of anatomy, 88(Pt 1), 25. Kappel-Bargas, A., Woolf, R. D., Cornwall, M. W., & McPoil, T. G. (1998). The windlass mechanism during normal walking and passive first metatarsalphalangeal joint extension. Clinical Biomechanics, 13(3), 190-194. Lucas, R., & Cornwall, M. (2017). Influence of foot posture on the functioning of the windlass mechanism. The Foot, 30, 38-42. Maitland, G. D. (1977). Peripheral manipulation. Butterworth-Heinemann. Neumann, D. A. (2013). Kinesiology of the Musculoskeletal System-E-Book: Foundations for Rehabilitation. Elsevier Health Sciences. Van Boerum, D. H., & Sangeorzan, B. J. (2003). Biomechanics and pathophysiology of flat foot. Foot and ankle clinics, 8(3), 419-430.